Organic essential oils are the pure extracts of plants that offer the full scent and taste of the plant. Organic essential oils may be taken from the flower, leaf, seed, fruit, root or bark of a plant, depending on the plant variety. These concentrated oils are used for massage as well as aromatherapy. Organic essential oils, such as organic lavender essential oil, is suitable for scenting oils used in massage therapy treatments. Most organic essential oils, because they are so concentrated, should be diluted with a carrier oil, such as olive oil or almond oil, in order for the product to be used safely on the skin. It only takes a few drops of organic lavender essential oil to scent your plain massage oil. Once it has been added, your skin will be scented with the pleasant and relaxing aroma of lavender. Massage oils that contain organic lavender essential oil or other essential oil scents allow the hands to pass smoothly over the skin, making it easier to massage tightened muscles and relieve the kinks. Organic lavender essential oil can also be added as a fragrance to body lotions and, in combination with carrier oils, as body soaks for use in the bath tub for a relaxing scented bath. 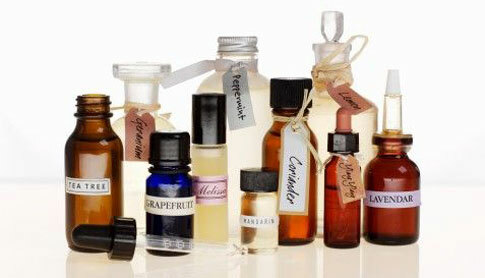 Aromatherapy Organic Essential Oils may be used to enhance your mood and create a pleasant scent in the air around you. Aromatherapy oils, which could include organic lavender essential oil, are spread throughout the air in a room through the use of a diff-user. There are several different types of diff-users used for various purposes. The smallest are personal diffuses and car diffuses. Personal diff-users are tiny bottles with a few drops of aromatherapy oils inside that are worn around the neck, and body heat is used to release the fragrant scent. Car diff-users are small containers that hold the essential oil, and can be hung from the rear-view mirror or plugged into your car’s cigarette lighter. Organic lavender essential oil can also be used in diff-users that scent your room. They might use a candle, a light-bulb, or electricity to heat the essential oils. Light-bulb rings are very easy to use. You simply place a metal or ceramic hollow ring on top of a bulb that is used in a lamp, place a few drops of oil in the ring, and then turn the light on. The heat from the bulb releases the fragrance. Candle diff-users offer a basin for the oil, with a candle below to provide the heat. Electric diff-users are useful for scenting an entire room, and often come with small fans built in to spread the fragrance. In all of these ways, organic essential oils are perfect for use in massage and aromatherapy applications.